Curious about what ORSP reviews before submission? Take a look at our PAF and Proposal Checklist to see what we check. Or review all the Roles and Responsibilities for Units, Principal Investigators, ORSP, and Finance - Sponsored Programs. Create a Proposal Approval Form (PAF) within your unit and via the eResearch Proposal Management (eRPM) system. Once internally complete and correct, route to ORSP for submission four days in advance of the sponsor deadline. Proposal development happens within the U-M departments or units of the various schools, colleges, or institutes. Proposal submission happens with ORSP when you route and we help submit your proposal, using the University of Michigan's eRPM system. 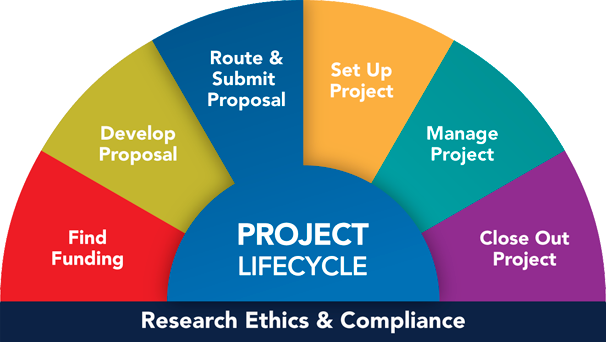 Tip: Before working with ORSP to route and submit your proposal through eRPM, first, confirm that it is a sponsored project. Any research or scholarly project proposal with outside funding must be processed through ORSP and documented in eRPM. Federal and state regulations and U-M policies guide the processing of proposals and submission to potential sponsors, as well as the subsequent handling of projects resulting from successful proposals. The PAF is completed and routed electronically with each proposal in eRPM. The person submitting a proposal must obtain approval of the appropriate Department Head and Dean or Unit Director before sending the proposal to ORSP. More detail about what is covered by the PAF is available, as is information on routing the PAF in the eResearch Proposal Management system. All sponsored projects must be submitted through ORSP via eRPM. The proposal is routed through U-M via the eRPM system with an accompanying Proposal Approval Form (PAF), created in eRPM, which documents university commitments to the project at each level from the department to the central administration. Below are questions you might encounter when submitting your project through eRPM. After you have developed your proposal with your project team, a best practice is to submit it to ORSP at least four business days in advance of the deadline for a thorough review. submit to the potential sponsor. ORSP requires a finalized PAF and final proposal four business days before the sponsor deadline and time. See the Standard Operating Procedure 200.01 on Proposal Review by ORSP for further guidance. When the PAF is first submitted for approval, the project director must determine if a financial conflict of interest disclosure is required. The conflict of interest disclosure asks about management or financial interests in outside entities held by key investigators or by their spouses or dependents that may impinge upon the proposed sponsored agreement. To assure full disclosure, this requirement should be interpreted broadly. See Conflict of Interest and Commitment for further instructions. If the disclosures are negative (that is, if it is determined there are no "significant financial interests" related to the proposed project), the Project Director will so certify by signing the Proposal Approval Form (PAF) in eRPM. The proposal and the PAF will then be further processed. Note the procedures for proposals with sponsors following the Public Health Service Financial Conflict of Interest regulations. Disclosures that may trigger State Law or are otherwise above the threshold of significant financial interests must be forwarded, along with a copy of the PAF, for review by the Conflict of Interest Review Committee. Proposals may be submitted to external sponsors in order to meet established deadlines with the understanding that the review process must be completed satisfactorily before a sponsored award can be accepted. The majority of U-M Grants.gov submissions are completed in eRPM via a system-to-system transmission. In the rare event that your Grants.gov submission is not supported in eRPM, instructions are now provided on working with ORSP to complete and submit your proposal via Workspace. The Manage Workspace Role allows you to prepare applications in Grants.gov Workspace. Select the REGISTER link at the top, right corner of the screen. Click on Get Registered Now. Complete the instructions and wait for your Temporary Code. Once you receive and enter, you can register to Add Organization Applicant Profile. Enter U-M's DUNS number: 073133571. Follow the prompts to proceed. Post a Comment in the PAF and change the Subject Line to "Request Manage Workspace Role." Provide your Grants.gov username in the Enter Comments box. Select your Project Representative (PR) and ORSP Staff as the email recipients. Please contact your ORSP PR with any questions. Do I submit the proposal to Grants.gov? How do I submit a proposal to a sponsor? To submit a proposal to a sponsor, you will use a Proposal Approval Form (PAF). Be sure to identify and work with your department research administrator. To find your administrator, visit the Blue Pages. To complete the PAF and sponsor application materials via eResearch (eRPM). A best practice is to check the Proposal Routine Checklist created by the Research Administration Schools (RASC) Committee. Do I need to register to have my proposal submitted via Grants.gov? No. Individual Principal Investigator registration in Grants.gov is not required. The University is fully registered for the Grants.gov submission process. When do I and/or How do I register for agency-specific registration (NIH Commons, Fastlane, NSPIRES, or other agency-specific registration)? Foundations - Go to specific foundation website. As always, contact your department administrator first with any questions. To find your administrator, visit the Blue Pages. Where can I find the information required for the standard (SF-424) forms? An SF-424 form, or "Standard Form 424," is the application packet used by federal agencies for grant submissions. Most standard information (DUNS, EIN, FWA numbers, etc.) is pre-populated in the required SF-424 forms when completing the application in eResearch (eRPM). If you find your application is not supported by eResearch you can find the standard information on the Frequently Required Proposal Data web page. I can't get my materials to ORSP in the timeframe specified in the ORSP service policy. Will you still submit my application to Grants.gov? In order to give your proposal a full review it is strongly recommended that you deliver it in final form within four (4) business days of the sponsor deadline. We will do what we can given the shortened time frame, but you run the risk of a submission that fails to pass the Grants.gov and agency validations. When a proposal is routed late we make every effort to execute it, but we mark it as "Insufficient Time for Review." Is there training on Grants.gov or eResearch? Yes, you can find workshop information here. However, most research administration workshops are currently postponed while we reevaluate and assess training. If you have questions, or if you have suggestions for other training, please contact David Mulder, Training Manger (davemuld@umich.edu). Thank you! Can I choose my submission method? My agency offers a choice between Grants.gov or other electronic systems. Which should I use? ORSP recommends using Grants.gov system-to-system submission (or other agency systems such as NSF's Fastlane or a unique sponsor system) whenever possible. This is integrated in the University of Michigan eResearch system. Note that some agencies specify that paper applications are required, and some will require only Adobe. Those are the only circumstances in which system-to-system should not be used. If I provide all the documents for my proposal, will ORSP fill out the Grants.gov forms for me? No, ORSP project representatives can provide guidance, but your first point-of-contact is your department administrator who can help with system and forms. I am submitting an NIH Revision Application. What info needs to be put in Box 4, the Federal Identifier field? Check the Resubmission application (Box 2) and enter the previously submitted NIH grant number (such as GM123456) in Box 4. Is there a way (at the department level) to track the progress of an application to see if it is funded, not funded, or pending? The Principal Investigator (PI) may be able to access this information using his/her login credentials for NIH eRA Commons or NSF Fastlane (or others). The status information that is available will vary from agency to agency. eRPM provides status on proposal submission for proposals submitted via system-to-system. To check the content of your electronically submitted proposal for selected agencies including NIH, use eRA Commons. For NSF, submitted proposals can be viewed in FastLane. No, you can't change the order. What do I do if I have 8 key personnel? When on the Research....(see screenshot ) page. Upload the additional Additional Key/Senior Profiles by selecting the button on the lower left. Who do I contact if I have questions about eRPM? As always, contact your department administrator first with any questions. For technical questions in eResearch, call 4-HELP. Who do I contact if the sponsor guidelines are not clear? Alert your ORSP Project Representative specific to the sponsor. Proposal Processing Deadlines When proposals are delivered to ORSP with four full working days, it is possible to correct items that the system marks as warnings, and give the project team time to complete gaps that coud negatively impact submission or prevent the proposal from being validated. Unfunded Agreement Types At any point of a research project you may need a Material Transfer Agreement (MTA), a Non-Disclosure Agreement (NDA), a Data Use Agreement (DUA) or another type of "unfunded agreement" (UFA). eResearch Tips and Tricks A comprehensive listing of job aids and resources from eResearch for the eResearch Proposal Management System (eRPM). eResearch Training - Finalize Sponsor Proposal Documents Process to prepare proposal for ORSP submission or Log Project Team submission to sponsor. For questions on government projects, contact your designated government team project representative or write orsp-government@umich.edu. For questions about starting your project, begin working with your department administrator. Learn more about the Proposal Approval Form (the PAF) in eResearch. Certain proposals (for DOD, DOE, EPA) require an Environmental Questionnaire to complete the grant application package. This multi-page form can only be completed by Environmental, Health, & Safety (EHS, formerly OSEH) and this complex questionnaire takes considerable effort in fact-gathering and verification. Thus EHS requires at least FIVE (5) BUSINESS DAYS before the completed proposal needs to be at ORSP.